OpenCart is among most popular platforms and lost of store owners are eager to switch to this solution. This open-source shopping cart gives you full control over coding of your site and opens many new possibilities to create effective store. One of the possible ways to switch to OpenCart from another solution or fill in your store with existing eCommerce data is CSV import. 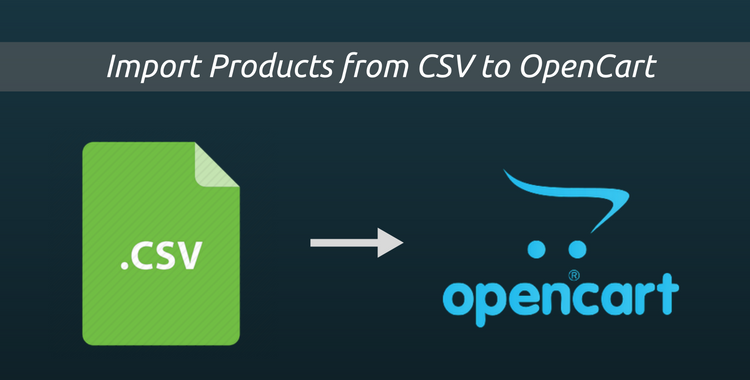 Now, raises up the question what is CSV and how to import products from CSV to OpenCart directly? What is CSV and How to Deal with It? CSV file is a comma separated values file that allows data to be saved in structured format. Traditionally CSV is plain text that can contain numbers and letters only. CSV are often used to to exchange data between different applications or software, especially if there is a huge amount of it. Almost all the platforms support the CSV format but how to deal with it properly? Being a common procedure, data import from CSV files to a shopping cart still puzzles lots of merchants. Even instructed by endless web-tutorials, both textual and video ones, store owners often mess up data placement during imports, lose info, or, contravisory, create unnecessary copies of it. The main reason of inaccuracies is this - each shopping platform gives out and receives CSV files in its own peculiar format and structure. Therefore, if you try to move data directly - you end up getting multiple mistakes. E.g you can’t move product variations and you are ought to create them manually from scratch. Another important thing you need to keep in mind when thinking to perform OpenCart CSV products import is that your CSV file should fit in size up to 15MB and not more. For this reason, manual import products from CSV to OpenCart will take lots of your time. And there is no guarantee of proper data transmission, unfortunately. If you are searching a way to speed up products import to OpenCart you can use some applications or scripts. There are few plugins on official OpenCart extension marketplace, e.g. ExcelPort. Though, these add ons facilitate the process of OpenCart CSV product import, they require some technical skills from you and some time input. You can always appeal to developers - but remember that will cost you a thing. Be careful with the apps you are using, some of them are of dubious quality and can lead to data loss and poor result. So, is there any reliable and easy ways to import products to OpenCart? We can suggest you one if don’t want to mess up with codes or face multiple errors. The easiest and safe way to perform accurate OpenCart CSV import and avoid many nuisances is to use an automatic migration tool Cart2Cart. To those looking to save time and transfer data without getting into technicalities - this service will be a saving grace. Cart2Cart allows to automatically import products to OpenCart is just few mouse clicks. What is important the service will not broke relations between your entities. You are welcome to check the quality of data transfer and perform a Free Demo to your live OpenCart store. Via test migration a limited number of entities will be moved to OpenCart in less than 30 mins. Later if you’re satisfied with what you get you can proceed with full products import to OpenCart. Today, we’ll describe, in detail, how to import products from CSV to OpenCart, recommend which measures to take before the procedure and right after it’s done. So, brew yourself a cup of tea and spend a few minutes on such a necessary education. First off, let’s make sure you’re prepared - download our template CSV file that’s structured accordingly to OpenCart requirements and adjust your current products file appropriately. Create a new Cart2Cart account or log in to your existing account (Facebook or Google+ account will do too). . Select CSV file as your Source Cart. Optionally, you can enter the URL of the store your CSV was exported from - that will allow you to transfer product images also. Otherwise, type in any URL. Choose OpenCart as Target Cart, paste its URL and download the Connection Bridge, unzip and upload it to your OpenCart root folder via FTP - detailed instructions on how to do that are right there on Migration Wizard. Set up the list of entities you’d like to transfer and, if necessary, choose additional options. Upload your products CSV and the file with product images if you want to migrate them as well. If you don’t - proceed to the next step. 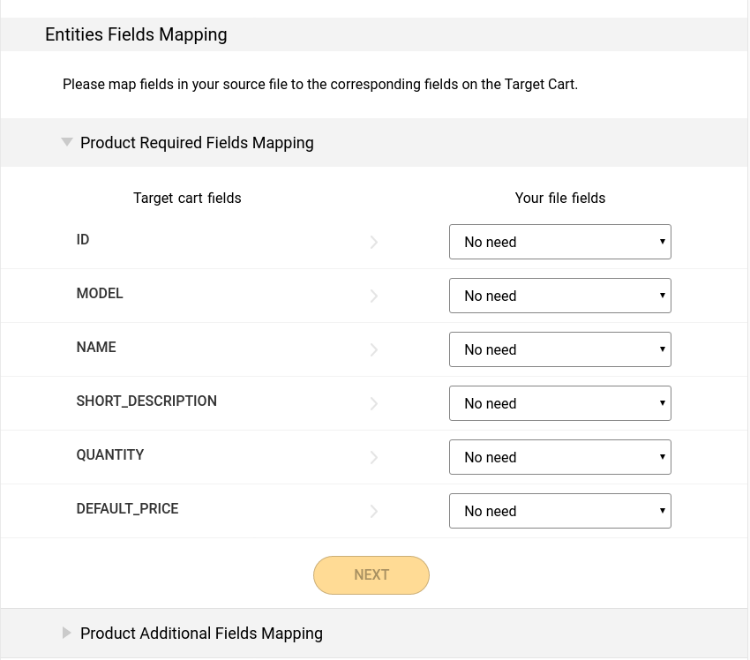 Map the fields in your CSV file with the corresponding ones on OpenCart. Demo data migration is a free procedure that gives you an idea of how our service functions, allows to move a limited number of entities to OpenCart live store and only takes about 30 minutes. Thus, you’ll be able to check if your CSV is structured correctly. This procedure is optional. 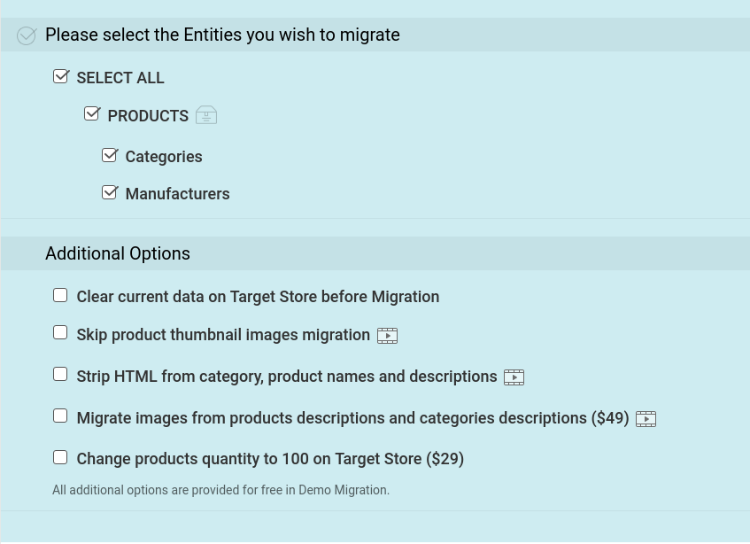 Finally, if you’re satisfied with the outcome of Demo import to OpenCart, double-check the entities you’ve picked and click “Start Full Migration” button. Import products to Opencart will start right away. After the procedure will be over, you’ll get an email notification with the results. If you see that some product images are missing - check your mapping once again, ensure that all the image fields are valid and full URLs are placed properly. If SKUs are not defined and paths aren’t valid - your CSV probably contains some inappropriate characters. Open your products file and look through the description thoroughly. If some data got duplicated - there likely was an SKU mismatch. Ensure all your SKU fields are mapped correctly. That’s it - you’re completely ready to import products from CSV to OpenCart without any hassle. Don’t wait any longer, see how your store looks like on OpenCart right now via FREE Demo Migration.